Here I go again, reviewing Greek yogurt. I can’t help myself! I think that January must be “launch a new yogurt month” because I noticed a big shift in the dairy case. I saw this Yoplait Greek yogurt and bought it with very low expectations. You see, two years ago, I wrote this: Three Reasons To Avoid Yoplait Greek Yogurt Ahem. I picked this up and decided to eat it for breakfast this morning. General Mills never contacted me about my review, nor did they send me any of their new yogurt, but I feel that they paid attention to my complaints. Here were my reasons for avoiding the old Yoplait Greek versus what I found out about the new one. 1. Old: Not Greek Yogurt - New: Greek Yogurt - seems that they skipped gelatin and protein concentrate and actually made Greek yogurt. This is a good first step in making delicious Greek yogurt. 2. Old: 18 grams of sugar per serving - New: 9 grams of sugar per serving - They cut the sugar in half, but they are using sucralose to make up for it. Honestly, I couldn’t taste the sucralose in the one that I sampled. 3. Old: Tastes terrible - New: Tastes pretty good. I actually enjoyed eating it which was a real shocker. It is 100 calories (2 Points+) and has 10 grams of protein. Is it as good as FAGE? No. But, it costs half as much. If you follow this blog, then you know I am not a fan of artificial sweeteners. This time, my only complaint would be to just leave out the sucralose and let it be more tart. I am sure General Mills doesn’t feel it can take that risk with the national palate. Chobani sent me a large cooler full of yogurt and I did find one in the box that I really like. They created this four pack of 3.5 ounce yogurts that are only 100 calories, no artificial sweeteners, and 8 grams of protein. Why do I like it? The point here is that you can attain 100 calories of tasty yogurt by eating less yogurt. 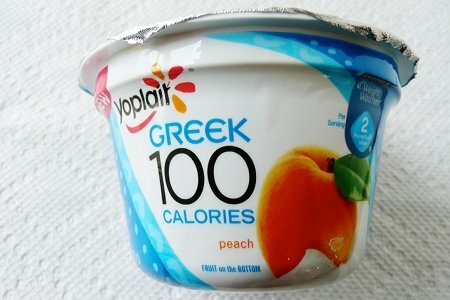 Yoplait Greek is 5 ounces with artificial sweetener to help it be reduced in calories. Chobani Bite is only 3.5 ounces and tastes better. Which would you rather have? Chobani Bite comes in four flavors: fig with orange zest, caramel with pineapple, coffee with dark chocolate chips, and raspberry with dark chocolate chops. It retails for $2.99 for a four pack. I haven’t seen it in my store yet, but they say it is available nationally. Have you tried the new Yoplait Greek or the Chobani Bite? Please share your reviews. I love the Chobani bites, well I only tried the coffee and chocolate one and I loved it! The only thing is the containers are so small, I want more!! I'm not a huge yogurt fan however, I do keep Yoplait Chocolate Whipped in my freezer especially for the summer after a walk when I need something..........However, the Chobani selection you described got my attention (raspberry/dark chocolate & coffee/dark chocolate. I will keep looking for them. How many grams of sugar are in the Chobani Bite? I used to LOVE Chobani Greek (my husband still does) but stopped eating it because their sugar content is through the roof! ADDICTED to the Yoplait Greek 100 Key Lime flavor - it is also one of the lowest in sugar. I have it with blueberries every morning. My sister just told me about the Chobani bites that she tried. She got them at Walmart. I have not seen at any of my local chain grocers. I've tried the new Yoplait, and I really like it. Actually, I was buying it even though I'd read your reviews of the older version....price-wise it fit into my budget (coupons! ), which is a big consideration for us. That's part of the overall problem - finding a good option that you can afford. Two of us eating a Greek yogurt every day (he only eats vanilla, but I need variety) adds up quickly. I'm glad they've improved the Yoplait - I feel better buying it now! Yoplait Greek 100 Lime flavor is my fave too! Hello, My son loves the yogurt that John Stamos has a commercial for. I just can't remember the name. It is very thick,and I think it tastes good..but I wonder about the fat content of it.What do you think SnackGirl? I buy it for my son,since he's 12 now...thinking better than junk food. I like you snack girl LOVE greek yogurt! I've tried everyone I can get my hands. I'm in LUV with these chobani bites! I've tried the coffee/chocolate flavor and the caramel pineapple. So far that's my fav! I have the raspberry/chocolate one but haven't tried it yet! Thank you for all the good info you put out! I'll be looking out for it! 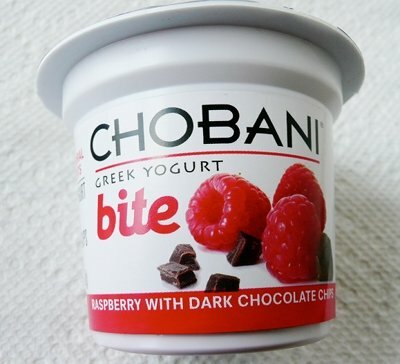 I have tried the Chobani bite in the raspberry dark chocolate. I loved it! not too sweet...just the right amount of choclate. I have never been a fan of Yoplait Greek because of the artificial sweetener taste...maybe I will try it again! I am and always will be a huge Fage fan! I don't know if I'll ever stray from Fage...it's just too good! The Chobani Bite flavors caught my attention though so I may branch out for the coffee and chocolate! I'm obsessed with Chobani in general and picked up the two flavors my local Target had--coffee with dark chocolate and dark chocolate and raspberry. They won't replace my breakfast chobani but for an afternoon snack I can't think of a tastier (healthy) treat. I am new to the Greek Yogurt Scene. I tried Greek yogurt, FOB (Fruit on Bottom) about a year ago and hated it! I am a textural person and the grittiness was just too much for me. Yesterday I saw in the store Chobani Blended Vanilla chocolate Chunk (7points for 8 oz – I have half the serving size). Okay…the girl in me saw Chocolate and just had to reach out and grab it and put it in my cart. When I got home I didn’t even put the groceries away before I popped the seal on that container, WOW! Loved it! So you are saying to yourself, that is not the best choice. Your right, but for a sweet treat, this is soooo much better than picking up the Blue Bunny Peanut Butter Panic Ice cream. Off I went to the Chobani website to check out what else they have that I can give a try. I think the next thing on my grocery list will be the Vanilla Chocolate Chunk Champions, (3 Points), The vanilla golden Crunch (4 Points), and the Raspberry with Dark Chocolate Chips (2 points). Yahoo! Can’t wait. I really liked the simply dannon flavored 80 cal packs, unfortunately I can't find them locally anymore. I just don't see all the hype w/Greek yogurt. Frankly regular yogurt is priced to high forget what the Greek stuff costs! Ariene, thats oikios and should be 0%. I buy it too and i love it! Normally i buy fage, but oikios is good too. Their stonyfield greek plain is also good bc its oranic, and plain so it dowsnt have sweeteners. But ill think about trying the bites! The fig orange sounds good! I tried the Yoplait yesterday.... Not a fan. I haven't tried the Chobani bites, but I'm totally addicted to the Chobani Black Cherry, it's amazing! I'd be extremely careful with anything that has sucralose in it. My sister started having blinding headaches and dizzy spells after eating it reguarly, and when she stopped (after being informed by another woman who had the same symptoms), her symptoms disappeared. I'm personally in favor of buying plain yogurt and adding whatever you like to it instead of buying this stuff.